Search and adopt a Toy Poodle near you. The Poodle is an exceptionally smart, active dog that excels in obedience training. The breed comes in three size, which contributes to why the Poodle is one of the most popular breeds according to AKC® Registration statistics. Poodles can be the following variety of solid colors: white, black, apricot and gray, but never parti-colored. The Poodle is believed to have originated in Germany. The English word "poodle" comes from the German word pudel or puddeln, which means to splash in the water. The breed was standardized in France, where it was commonly used as a retriever. The large, or Standard, Poodle gained special fame as a water worker. So widely was it used as a retriever that it was shorn of portions of its coat to further facilitate swimming, this is where the custom of clipping to pattern which so enhanced the style and general appearance that its sponsors, particularly in France, were captivated by it. The Poodle's ancestors were acknowledged to be good swimmers, although one member of the family, the truffle dog (which may have been of Toy or Miniature size) is said, never to go near the water. Truffle hunting was widely practiced in England, Spain and Germany, where the edible fungus has always been considered a delicacy. For scenting and digging up the fungus, the smaller dogs were favored since they did less damage to the truffles with their paws than the larger kinds. Most poodles have a dense, curly, low-shedding coat that requires regular grooming. Since poodles do not have the plush double coat of many breeds, their fur is often referred to as "hair". Most poodles are solid-colored, and many registries only allow solid colors in shows. “Parti-colored” poodles have large patches of colors different from the main body color. 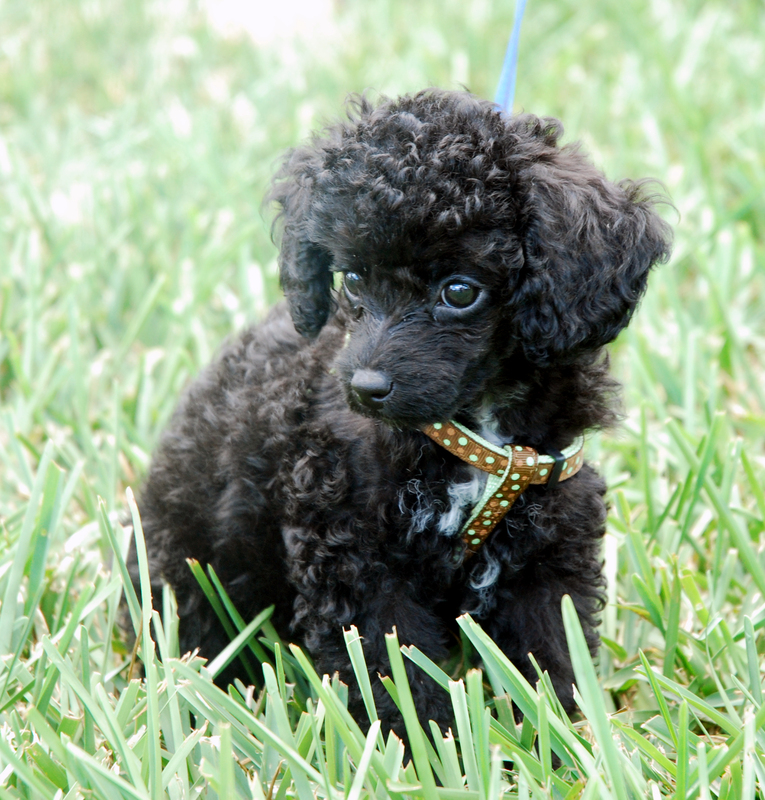 “Phantom” poodles have the color pattern of a black-and-tan dog, although not necessarily black and tan. Solid-colored poodles may either "hold" their color (i.e., stay more or less the same throughout their lives) or "fade" or "clear" to a lighter shades. Usually the ears and the thicker guard hairs hold more original color than other hair. The tail is usually poofy, often docked in the US and less often in Europe; the practice is illegal in the UK and Australia. These days, tails, when docked, are left much longer than in the past. “Bunny-like tails” (very short-docked tails) are now rarely seen except among puppy mill pet shop dogs. Poodles have drop ears, which are not cropped. Unlike many breeds, poodles can come in a variety of sizes, distinguished by adult shoulder (withers) height. The exact height cutoffs among the varieties vary slightly from country to country. Non-Fédération Cynologique Internationale kennel clubs generally recognize three sizes, standard, miniature, and toy, sometimes as sizes of the same breed, and sometimes as separate breeds. The Fédération Cynologique Internationale recognizes four sizes of one breed, standard, medium, miniature, and toy. The Fédération Cynologique Internationale describes a maximum size for standard poodles. The term’s royal standard, teacup, and tiny teacup are marketing names, not recognized by the major kennel club. Unlike most dogs, poodles have a single layer (no undercoat) of dense, curly fur that sheds minimally and could be considered hypoallergenic (though not completely allergen free). Texture can range from coarse and woolly to soft and wavy. Poodle show clips require many hours of brushing and care, about 10 hours/week for a standard poodle. Poodles are usually clipped down as soon as their show career is over and put into a lower-maintenance “pet cut”. Pet clips are much less elaborate than show and require a lot less maintenance. A pet owner can anticipate grooming a poodle about every six to eight weeks. Although professional grooming can be costly, poodles are easy to groom at home if one has the proper equipment. There are several “cuts” to choose from. Otherwise notable is this breed's sense for instinctual behavior. In particular, marking and hunting drives are more observable than in most other breeds. Even Toys will point. Classified as highly energetic, poodles can also get bored easily and have been known to get creative about finding mischief. Poodles like to be the center of things and are easily trained to do astonishing tricks involving both brains and agility. They have performed in circuses for centuries, and have been part of the Ringling Circus in its various forms from its inception. The Grimaldis, famous British clowns Kenneth and Audrey Austin, "developed a stronger circus act" with a clever Poodle named 'Twinkle,' the success of which allowed them to continue performing even as octogenarians." Poodles are extremely people-oriented dogs and are generally eager to please. Standard Poodles in particular tend to be real good with children. Poodles are adaptable and very easy to train. Like most dogs, they appreciate daily exercise, such as walks and play sessions. Most Poodles are fairly agile and athletic. Toy Poodles love to play ball and fetch. Playtime is vital, but one must be sure that they get plenty of rest following long periods of exercise and that fresh water is available at all times. Potty training may be difficult in many dog breeds, but the poodle is one of the easiest to train. Whether going outside or being trained on a pad, they learn quickly where to go. However, they need time to understand what is desired of them. It may take a while, but poodles are quite smart and learn more quickly than most dogs.